You know those people that are so far behind it looks like they are in front of the race? Well, that’s what I feel like. There are so many food ideas in my head, written on post-its, scribbled in my notepad. Bookmarks in magazines and cookbooks and we won’t even discuss the long list in my email and favorites. Are you one of us? Do you have any pointers on time management? Have you pulled all of your hair out yet? 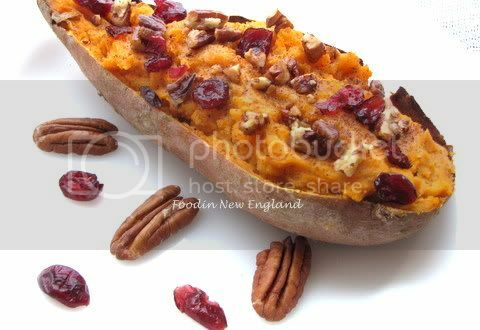 Anyway, back to the original idea for this blog, sweet potatoes. I wanted to bake and stuff them. You can also make these in a small casserole dish instead of back in the shells. I think it adds an extra special touch. Also, toasting the pecans adds another extra special touch, and it only take a couple minutes. Wash potatoes and prick with fork. Bake in a 375 oven for approx. 40-60 minutes, depending on the size of your potato. Remove from oven and let cool. Cut in half and scoop out insides carefully with a small spoon. Place in medium bowl and add milk, vanilla, cinnamon, sugar, and optional nutmeg. Mix well. Place mixture back into potato skins. Sprinkle with pecans, cranberries and dot with tiny pieces of butter.